New Art Contest at @biomech_collective! We are excited to announce the next in the series of art contests that we are hosting at the @biomech_collective Instagram page. These six contests are aimed at creating new art material for the upcoming Biomech Encyclopedia book project, which we hope to have ready for distribution in the spring. 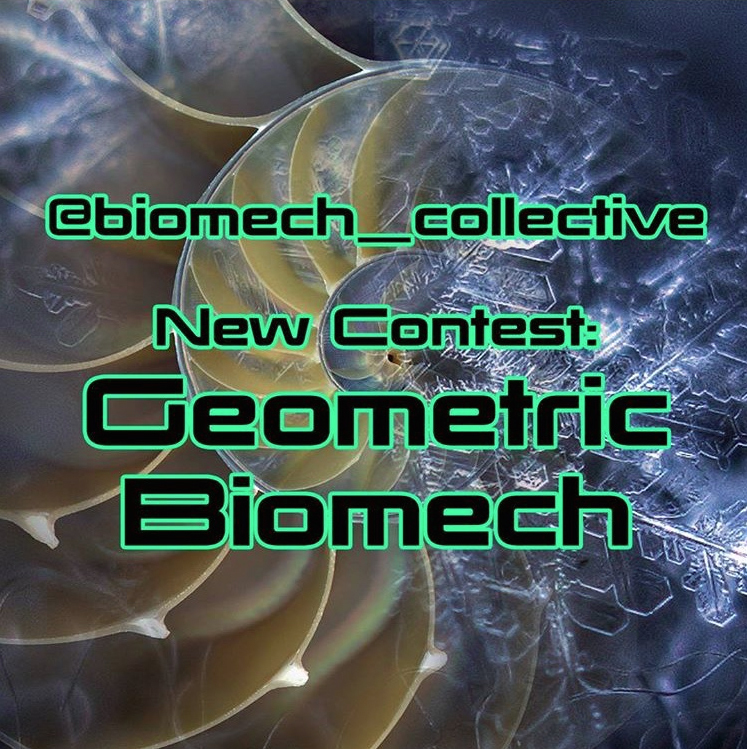 Already we have had some great submissions from various artists for the Architectural Biomech and Steampunk Biomech contests, and have just kicked off the third contest: Geometric Biomech. Geometry: It's everywhere, hinting at the codes of creation! There are countless creative ways that geometry could be combined with biomech, and we are curious to see how you all do it. This is a chance to mix and match tattoo styles in ways never attempted! Imagine an organic environment peeling away to reveal complex and flawless otherworldly mathematical forms. Robotic elements with geometric motifs mapped over their surfaces... where else can this go? Entries can be done solo or in collaboration; we encourage collaborations because it's fun and results in surprising things. You've got two weeks, and then it will be time for the next theme, which will be announced on October 12. These coming months will consist of nonstop art contests at @biomech_collective, and we hope you'll be involved! Just remember to tag #categorycrunch with each submission so that we can see it. 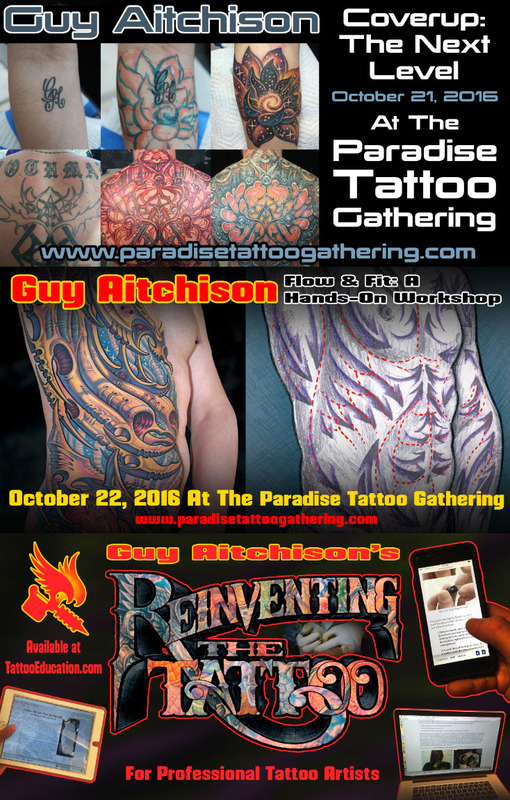 I also wanted to remind you of the two seminars that I'll be offering at the Paradise Tattoo Gathering next month on October 21 and 22. First comes Coverup: The Next Level, which is built around a recent coverup tutorial that I made for Reinventing The Tattoo but goes much further, with many new examples of photos and video material from this past year's coverup projects. Participants will be asked to bring along photos of their own coverup challenges that we can discuss in detail and find the best solutions for. Then, on October 22, I'll be teaching a class called Flow & Fit: A Hands-On Workshop, where we will go into depth about theory on making graceful, powerful compositions on the human body, which will include several short exercises which will be evaluated in the class context. You can read about both courses at TattooEducation.com, where we are also offering a deal for anyone who wants to take both classes- buy both tickets and you can get a subscription to Reinventing The Tattoo at 50% off! If you are already a member, you can apply this special offer towards a gift subscription, or toward renewing your own subscription so that you don't miss all the cutting edge new material that is being regularly added to the curriculum.